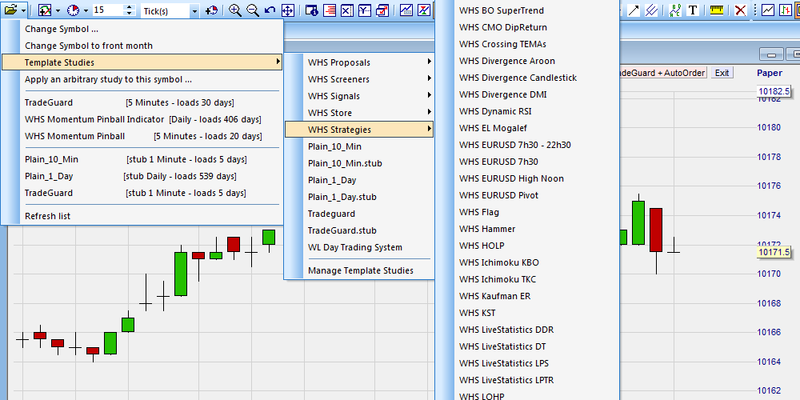 Over 60 FREE ready-to-use trading strategies are integrated in the NanoTrader Full. New strategies are added regularly. Strategies can be added upon request. They can be modified (without programming). Additional indicators, stops, etc. can be added (without programming). They have been designed by well-known traders. They cater for every trading style (scalping, day trading ...). They can be traded manually, semi-automatically or automatically. You can also assemble your own trading strategy. In most cases this can be done without programming. All strategies are complete strategies meaning they have rules for opening the position, managing the position and closing the positions. Many of the strategies include trend filters and time filters. All strategies are free and can be found in the WHS Strategies folder. You can see the folder in the illustration above. Many of the strategies have been designed by famous traders from all over the world. This example shows the Range Leader strategy designed by Charlie F. Wright. A short sell signal just occurred. The Range Leader strategy is very popular. Wright’s objective was to create a simple strategy for the part-time and novice traders. He seems to have attained his objective as the Range Leader concept is indeed simple and easy to understand. The integrated strategies cater for all trading styles: scalping, day trading, break-out trading, swing trading, etc. This example shows a scalping strategy called Scalping SCD. This trading strategy can be classified as a trend continuation strategy following micro-retracements. All traders have their preferred instruments. Some of the integrated trading strategies focus on a single instrument such as the EUR/USD or a particular market index. However, the majority of the trading strategies can be deployed on several instrument categories. Traders who prefer stocks, forex, CFDs or futures will all find a good selection of strategies which they can explore. Strategies can be used without modification or, they can be modified (time frames, stop and target distances, stop types ...), simplified or expanded (add preferred indicators, different stops, trend filters ...). All is possible without programming. The instant equity chart allows traders to immediately measure the impact of any changes they make! Professional trader Wim Lievens likes the NanoTrader trading platform. He is the inventor of the famous WL Bars.